Or leave and thrive somewhere else. We, like seeds, need goals. This entry was posted in Seasonal and tagged crepe myrtle, Haiku. Bookmark the permalink. I love this – a perfect balance of beautiful words and picture! Thank you so much — glad you enjoyed it! So beautifully expressed, Debbie! Isn’t it something how when were are attuned to nature, it guides us through life? Thanks for sharing your inspiration, my friend. The difference is that seeds can only produce what they’ve been programmed to produce — albeit with some variation. On the other hand, we have remarkable freedom to choose what we become. That’s part of the fun of living. It is fun to see your crepe myrtle doing so well. I remember an earlier photo where it wasn’t looking nearly so perky! You’ve made a great point, Linda. We do have freedom to choose — within reason, of course. There’s NO WAY I’ll ever be an Olympic swimmer, for instance, ha! 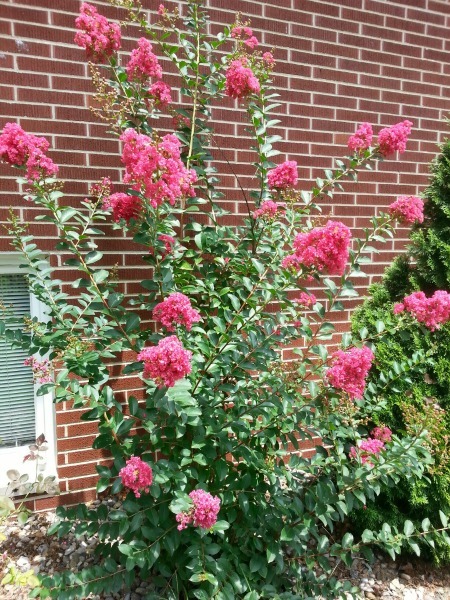 I’m sooo proud of my crepe myrtle! It’s way taller than I am now. I guess, hardy as they are, they still like to be babied through those Illinois winters!! Your Crepe Myrtle is looking fabulous! I am happy mine made it through the winter and has started blooming. Thanks, Suzi. I’ve tried pruning it into a tree, but it insists on being a bush, so a bush it is! At least it’s a beautiful bush! I imagine yours are gorgeous — what colors do you have? Mine is fushis, and a tree. The hubby wanted white, but I won that one! Love this, Debbie. I could add we need to have goals that are like seeds in that they grow. So true, my friend. What’s the point of goals if they don’t grow with us?! Great one, Debbie! I love Crepe Myrtles. Me, too, DD! This must be a hardy variety because it’s growing pretty well here in Illinois. Of course, I’ve got it on a south wall, too! The Crepe Myrtle is lovely and also one of my favorites. You also shared some great advice. I’ve been thinking about relocating in the next year…. Relocating? Really? Well, I suppose I, too, will one day…but when is up for grabs. Right now, I just have no idea where I want to be, ha!! Perhaps the grass is always greener on the other side of the fence?!! When I lived in California, I felt like I was totally out of my element. I guess I’m someone who needs the climate and environs of the midwest to bloom! Good to recognize that, Mo! I rather enjoyed living in other states, learning about things we didn’t have when I was growing up in the Midwest. I suppose that’s just a difference in people, one that makes them so fascinating! We have one Crepe Myrtle that color out here at the lake in AL. Mom always loved those flowers and I think of her every time I walk by it when I’m here. Didn’t know they were called watermelon. That’s kinda cool! Some of the roads we travel in Mississippi have medians planted with Crepe Myrtles. When they’re in full bloom, they’re spectacular! Ah beauty, thy name is flower! You know me, I’m a sucker for flowers and this one’s a beaut. I even love the name, which I’ve never heard before. Rather poetic. These beauties are all over the South, Monica. They’re particularly tolerant of heat, so I guess they’re ideally suited for those temperatures. I’ve seen them in this medium pink color, in white, pale pink, and even lilac. They’re truly magnificent when in full bloom! Such a lovely compliment, Cindy — thank you!